Take sharp scissors and poke several large-ish holes in the bottom of your plastic pie container. Cut as many 2-foot lengths of string as you have holes. Poke string through holes and pull about 8 inches of string through the bottom of the pie container. Leave strings dangling. Spread out the excess string on the bottom of the pie container. It will look like a pile of spaghetti. In a bowl or bucket, mix your seed-starting medium with water until the soil is moist, not wet. 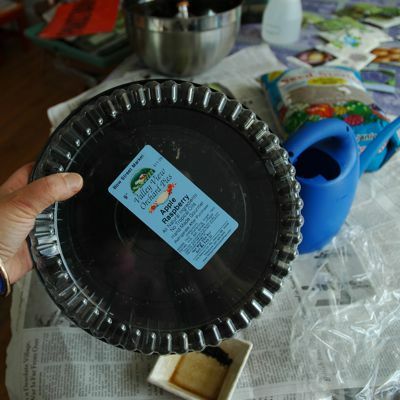 Fill pie container with damp seed starting mix, until it is about ½ an inch from the top. It will go right on top of the string pile. Gently flatten and pat down the soil. Follow the directions on the back of your seed package carefully. Do not plant seeds deeper than is recommended. Gently pat the soil on top of seeds. Replace plastic cover over pie container. Fill the bottom container or bowl with warm water, and set the container with your seeds on top of it, so that the strings, hanging down are sitting in the water. That way they will wick up water into your soil, keeping it moist, not wet. You don't want the seed container itself sitting in the water. Check every day to make sure the bottom is filled with water. If the soil feels dry use a spray bottle to mist until the soil is moist. Make sure to label your seeds. Place seeds in a warm spot until after they have germinated. Remove clear plastic cover after seeds have germinated. Keep bottom filled with water—do not let the soil dry out. Make sure seeds get enough light after germination. When Choosing a Plant Container the Options Are Limitless. What's the Best Way to Get Rid of White Fuzzy Mold on Seedlings? Do Water Retaining Crystals Really Do What They Claim?